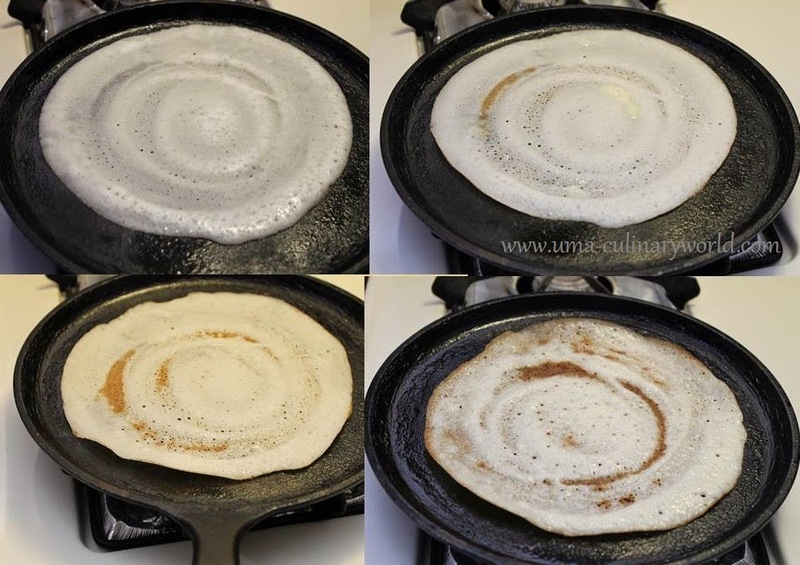 Preparing a traditional dosa batter is a time consuming and elaborate process of soaking, grinding and fermenting. Some foodies don't like fermenting the batter. I prefer Instant recipes cause of time constraints. Let me tell you my quick way of making everyone's favorite Masala Dosa. In a blender/grinder add rice flour, urad dal flour, besan, thin poha, little salt and 2 cups water. Blend/grind until all the ingredients are mixed well. Stir with a spoon or spatula and pulse the batter again for about a minute. This will aerate the batter a little. Set the batter aside for about 10 minutes. After 10 minutes, you'll notice the batter has thickened. Now add the remaining 1/2 cup water and beat the batter well. The batter consistency is thick enough to coat a spoon, but thin enough to be easily spread with a ladle. At this point, you can add 1/4 tsp baking soda if you like. Baking soda helps the dosas turn more crisp. I didn't add soda for my batter. Heat a flat cast iron pan or a nonstick pan. I prefer a cast iron pan. Lightly grease the pan with oil or butter or cooking spray. Butter gives a nice brown color to the dosas. Pour a ladle full of batter in the center of the hot pan. Spread the batter with the ladle, clockwise in a circular motion. Drizzle some oil or butter. Add butter or oil generously for the dosas to turn more crisp. The edges will start leaving the pan after a minute or so. When the dosa starts turning brown, spread Potato Bhaji on the dosa and fold it. You can flip the dosa and roast the other side as well. Serve hot Masala Dosa with Coconut Chutney and Sambar.